Man it’s hot in NYC this week! With temps hitting the 90s, I was in the mood for something delicious for dinner last night, but didn’t want to fire up the oven. A night earlier, I had dinner with my friend Andrew at Fort Tryon Public House. It’s a great bar and grill up in my neighborhood of Inwood that I will be reviewing for you sometime soon. They have a watermelon salsa on the appetizer menu that I’ve fallen in love with. I was trying to come up with a recipe last night to try to recreate the salsa at home. While working, I had The Food Network playing in the background and Ina Garten’s Barefoot Contessa was playing. It was like she was reading my mind!!!! 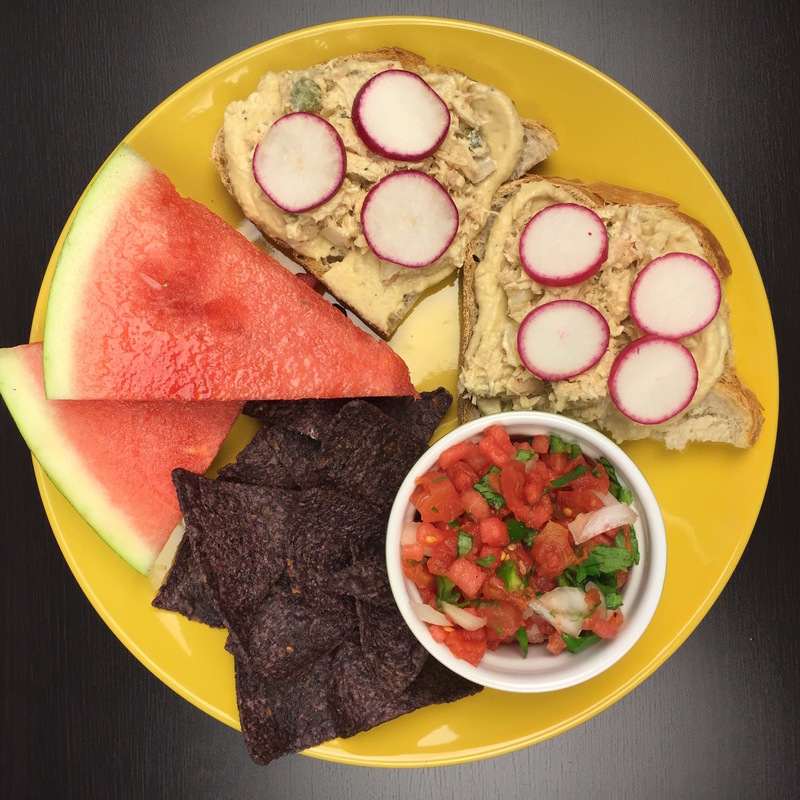 The episode had a great tuna salad and hummus open-faced sandwich recipe that got me drooling. Since I had to go to the grocery store anyway to get some ingredients for the salsa, I decided to make her sandwich too and dinner was set. Ina already has everything you need to make the sandwich, so you can click on this link to get that recipe. Below is my recipe for the watermelon salsa. It turned out great and I think that in addition to serving it with chips, this would be great on fish tacos or as a topping on lime grilled chicken or tossed with grilled shrimp…really anything that needs a sweet and spicy crunch. Enjoy and give the oven a rest on a hot summer night. This sweet, light and crunch salsa is a surprising alternative to the traditional tomato based ones you're used to. 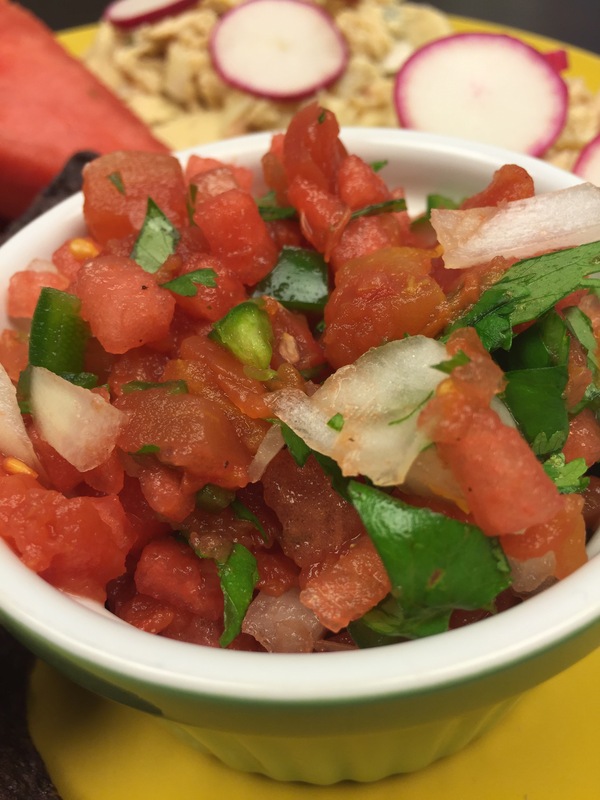 This salsa is great with chips or as an addition to another dish. It works especially well with fish. Cut open, seed and dice a jalapeño pepper and dice a small onion. Add both to the bowl. Drain a can of petite diced tomatoes well. Try to remove as much water as possible. Add to the bowl. Rinse, dry well and chop 1/2 a bunch of cilantro. Add to bowl. Juice 1 small lime and add to bowl. Salt and pepper to taste. Give the salsa a good stir and place in the refrigerator for at least an hour to let the flavors mix.